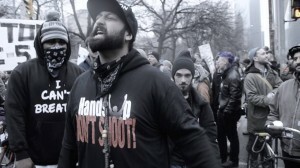 YbsFrack sent the video above titled, “Hands Up Don’t Shoot” to us, via the CopBlock.org submit tab. I’ve spent the last 30 mins blasting it through my iMac and couldn’t appreciate the message more. I know Danny included it in his recent post about music helping spread the police accountability message, but this deserves its own post from me. There are so many one liners and strike the root messages in this song that I just couldn’t resist posting it again. As Joshua recently mentioned in his post seeking celebrities, for the purpose of using their fame to bridge the gap between some people and the reality of the police state, I see music as one of these mediums, too. I think “Hands Up Don’t Shoot” by YbsFrack, Chris Golden, & Michael Gee (aka Mic Gutz), put together one of the most strike the root, call it how it is songs that I’ve heard in awhile. Well done guys, I hope to see them rocking some CopBlock.org Gear in the next video.